The cover if the DVD caught my attention, because of the nice vector in the front. 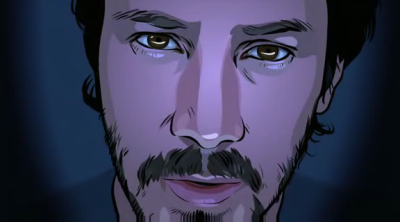 A Scanner Darkly is a masterpiece of animation. The main characters actor is Keanu Reeves which makes the movie more interesting than it is in the first place. The visual effects reminded me of the comic shooter XIII. The main character, Bob, lives his life in a world that is poisoned by total observation and a mysterious drug named substance D. The open ending of the story is partly directed to the audience. What are we believing and what do we want to believe? Hello and a big sorry for my non-german readers. Diesen Post werde ich entgegen meiner Gewohnheiten auf Deutsch verfassen um auf die MissstÃ¤nde und Probleme einer Ãœberwachungsgesellschaft hinzuweisen. Unserer Gesellschaft. Schaut es euch an, verschickt es weiter und achja werft einen Blick aufs Thermometer.